I have been back in Lausanne for a week now. We have been doing some final training on maps in the area preparing ourselves for racing next week. Aside from the orienteering the highlights have included a trip to France to watch a stage of the Tour de France, and Matt Ogden winning NZ’s first Gold Medal at Junior World Champs (JWOC). On Wednesday some of us interested ones left the relative safety of Switzerland and headed across the boarder 1hours or so into France to the town of Culoz. The town was in full Tour de France swing with cars, stalls, people, bikes everywhere. We found a park down some back alley and wandered about 5km up the hill to find a good spot to watch! The spot we found was really cool it had an awesome view and you could see a long way down the road. After waiting a couple of hours the Cavaran passed by with heaps of free handouts, which seemed to go one for quite some time! A Convoy of 7 Helicopters signalled the arrival of the Riders. 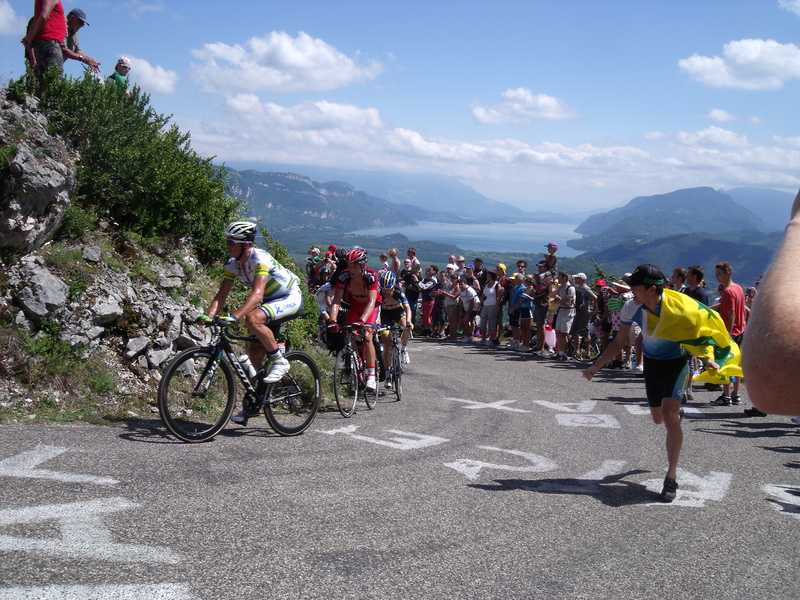 We watched them go through the town of Culoz from high above and then wind their way up the steep slopes of the Col du Grand Colombier and eventually the raced past us at high speed. By the time the riders reached us they were quite spread out and we got a good look at most of them. Finally in the last bunch of riders Greg Henderson the only New Zealander in the race passed by, even taking his hand off the handlebars to give us a wave. Exciting stuff… although the most exciting stuff to come was a day later when News filtered through from JWOC in Slovakia that Matt Ogden had won NZ’s first gold medal in orienteering. This was a massive achievement for Matt himself but also for NZ. Just goes to show that’s its not all as far fetched as it seems!